NORTH AMERICA – The Coca-Cola company has relaunched Diet Coke, its zero calorie beverage brand in North America, following a two-year innovation process fuelled by consumer research and preference for big, refreshing and great-tasting flavors. According to the company, the re-energized and modern Diet Coke has an updated look and sleek new packaging. The company has also debuted four bold, new flavors – Ginger Lime, Feisty Cherry, Zesty Blood Orange and Twisted Mango – targeting new generation of drinkers. It is the first major update of the brand since its inception in 1982. “Diet Coke is one of the most iconic brands loved by millions of fans in North America,” said Rafael Acevedo, Coca-Cola North America’s group director for Diet Coke. “Throughout this relaunch journey, we wanted to be bold, think differently and be innovative in our approach. Coca-Cola’s R&D team developed and tested more than 30 Diet Coke flavor combinations, featuring tropical, citrus and even botanical notes to get ideas and inputs of more than 10,000 people from across the country on potential flavor extensions and packaging updates. The four new variants were the ones that received the most positive consumer responses, says the company. The flavors add to the unique, crisp taste of Diet Coke to bring bolder tastes and more dynamic and uplifting experiences. Coke says that Diet Coke and its new flavors complement the brand’s no-calorie cousin, Coca-Cola Zero Sugar, the recently launched zero calorie sugar brand. “For a design team, the opportunity to rethink such an iconic brand with the scale and reach of Diet Coke – to build on its heritage and create a visual language that will help write its next chapter – is a rare brief. This visual evolution elevates the brand to a more contemporary space, while still using at its foundation the recognizable core brand visual assets,” said James Sommerville, vice president, Coca-Cola Global Design. The company says the iconic silver colour of the brand complements its new look-and-feel that has a simplified color palette focused on silver and red with accents of bold color to represent the new flavors. “With a brand recast, designers are challenged with determining how far is too far, and how close is not far enough. We set out to demonstrate progressive change and innovation with a look that would appeal to a consumer seeking bolder flavors, but without alienating the loyal Diet Coke fan base,” Sommerville added. “We continue to believe and invest in Diet Coke because it’s a great-tasting, zero-calorie beverage loved by millions. While the low- and no-calorie beverage category has been under pressure, its performance has been improving recently, and Diet Coke remains an incredibly strong brand. Following the double-digit growth, we’ve seen from Coke Zero Sugar since its introduction last fall and with this full Diet Coke brand re-launch, we believe we can continue to re-energize and strengthen our no-calorie business. We’re building a portfolio for the future with great-tasting options people want,” Avecado explained. 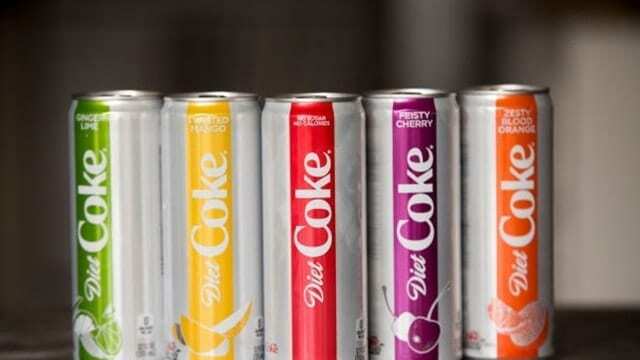 New packaging in sleek 12-oz cans will give Diet Coke and its new flavors a more contemporary feel, refreshed visual identity and sold as on-the-go singles and in eight-packs, Coke says. Diet Coke will continue to be availed in package sizes including the standard 12-oz. cans, mini cans and glass bottles. The brand’s new design and flavors will be available first in the United States, followed by Canada in February, before rolling into the rest of the World.